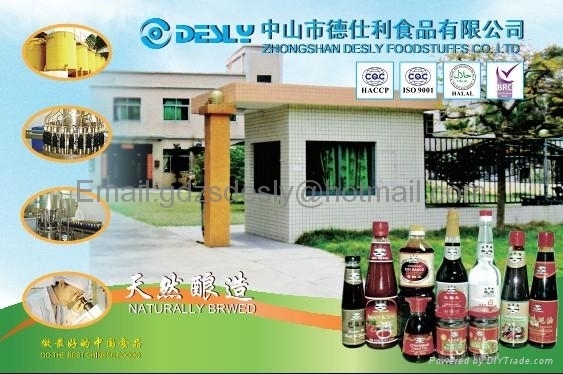 Located in the hometown of Mr. Sun Zhongshan (Sun Yat-sen), Zhongshan City, Guangdong Province, Zhongshan Desly Trading Co.,Ltd is a diversified comprehensive foreign trade firm integrating entity as the support, foreign trade as the development, mainly engaging in the exporting of chinese foodstuffs and daily commodity to all over the world. The company possesses plenty of famous brands such as Umi brand and also accept a number of domestic and aboard well-known brands of consigned OEM business. At the same time, the company as well possesses two principal factories, both of them have passed ISO9001: 2000 standard quality management system and HACCP system certificated, maintains strict quality assurance. Since its establishment, the company adheres to the development strategy " Taking market as the orientation, Considering trade as the bridge, Esteeming entity as the support, Regarding brand as the life " all along , actively exploitting domestic and foreign markets. Through the continuous efforts of all the company people, inspired by the company spirit of "Unity, Honest, Enterprising and Innovative", the company has established a stable and longstanding economic and trade relationship with many customers in South America, Europe, Oceania, South East Asia, Africa, Indian Ocean, etc where, far more than twenty countries. The products are widely accepted by the consumers and awarded the high recognition. Looking forward to the future, Zhonshan Desly Trading Co.,Ltd will continue to base on the equality and mutual benefit and uphold the principle of "Quality First, Customer Foremost". Here we warmly welcome friends old and new, home and abroad, to cooperate with us to strive for a brighter future! Thanks for your consistent support & trust , it will always be our expectation & motivation. Copyright1999-2009 Zhongshan Desly Trading Co.,Ltd. All rights reserved.